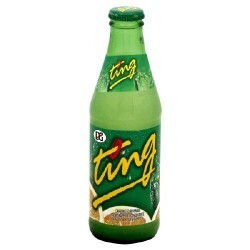 After spending the past week on the beautiful island of Barbuda (Just off the coast of Antigua) in the West Indies, I thought I would share with you the family favourite drink of the week: TING! It is a popular carbonated caribbean beverage made from Jamaican grapefruit that is both tart and sweet! Ting is extremely refreshing, and can quickly be transformed into an alcoholic beverage with the addition of a little vodka! A favourite for the week whether you were three or twenty-three, ting is great! I think you can buy it in Loblaw, but for those of you living on the East Coast I know for a fact Ting can be found at the Atlantic Superstore!